Note the excellent jam:cream ratio and the correct cream-on-top arrangement. Tasty. We seem to be developing a distinct food theme to our wedding anniversaries, and there’s just twelve months to think up what comes next! Instead of a honeymoon to look forward to this year, we should finally be moving house this month, if all goes well! The results of the survey arrived on Saturday and at least there were no surprises there. The lack of a recent blog post is because I spent a glorious week beyond the reach of the internet in a cottage in the Brecon Beacons. No broadband, no telephone, no wifi and no mobile phone signal! Bliss. Instead, we did have lots of sun, waterfalls, roman roads, reservoirs, mountains, mountain railways, coal mines, and castles. And a TV (freesat) so Jo could keep up with the world cup! The lack of rain was a bit of a surprise, which meant we ended up in the pitch black down a coal mine on the hottest day of the week. I think the guide thought we were mad but, having been waiting for a rainy day to visit the Big Pit, it was the last day of our holiday. It was well worth a visit anyway; probably my favourite part of the week, despite banging my head repeatedly. Fortunately they supply hard hats! Not much about this place on the internet, which isn’t surprising given it was right next to our cottage! I thought we might visit more often but we actually only went once in the end; it didn’t open until 11am and Jo did a great job with the self catering. The walnut and cherry cake made a welcome arrival snack before we settled in to the cottage though. Should have got a slice or two to go before coming home! The best thing about a cream tea here is the view. Certainly the best view from any of the tearooms we’ve visited so far; the photos on their web site don’t do it justice. You can take your own food for a picnic, which would have been nice if we’d have come prepared. No problem though, the cream tea did the job, with Jo describing the cream as, “Just like whipped clouds.” Plenty of whipped clouds as well, stretching the jam/cream ratio slightly with those tiny jars of jam. Certainly too much cream to entertain any daft ideas of putting the jam on top. I also made an impulse purchase of a package of Welsh cakes before we left. Definitely need to find somewhere that sells those round here! We spent a very nice long weekend loafing around drinking tea, mostly at home to avoid any lovely bank holiday traffic. We did end up getting out to two local tearooms over the weekend as well; once before getting lost in the Meon Valley and the second time to catch up with friends from the other side of Hedge End. This was the first time we’ve been here since it became Lilly’s Tea and Coffee House, and it’s much better than before the make over. It seems quite spacious inside and there was a very tempting selection of cakes, but we both went for a cream tea. 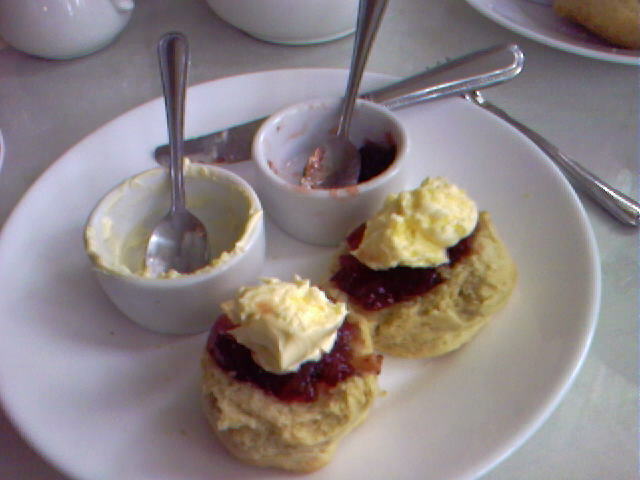 My only complaint with the food was the jam, cream, scone ratio: tiny jar-plenty-1! There just wasn’t enough scone to hold all the cream! Nice scone though, and larger than average, but just the one. There were also a surprising number of staff, most of them looking slightly frazzled though. Despite being a good half an hour before closing time, we had the nagging feeling of not being made particularly welcome. They were all very efficient but Jo thinks they may not have heard of service with a smile. Second time at the Anvil and I was very much looking forward to another slice of Tunisian orange cake. There was a scary moment when it looked like someone was buying the last piece!!! Luckily there was another whole cake ready to go, and it was every bit as good as I remembered. Jo had another cream tea, just for the purpose of comparison of course. Much better jam, cream, scone ratio, with the ideal two scones and bowls of jam and cream. There was also butter here, which is nice. As before, the service is more unique than the average tearoom, which I like. And the singing chef is still singing. If you want a more modern cream tea, I’d recommend Lilly’s tearoom, but my favourite is still the Anvil. I’m quite partial to a nice cup of tea and a slice of cake, but finding a good tearoom while out and about is a bit hit and miss. For full-fat dining, Jo often checks the ladies who lunch reviews before booking a meal. Unfortunately when it comes to tearooms, there doesn’t seem to be anything similar; I can find a tearoom in Boston, but there’s slightly less to go on in Hampshire! The tea and cake was excellent in this slightly random tearoom/wine merchant combo. We took my mum here for some lunch recently, so I also had my other favourite food at the same time: pie! There’s entertainment as well as food on offer with a fire alarm (not exactly a rush for the door- luckily it wasn’t my food!) and a singing chef, so be prepared! My mouth’s watering just thinking about the Mexican chilli pie and the Tunisian orange cake. Definitely recommend a visit- check their website for directions. We probably wouldn’t have found the Folly Tree without the internet so I’m glad Jo planned ahead. I had a starter before getting to the cake- it’s been a while since I had a proper bacon sarnie, mmmm, bacon cooked to perfection, thick white bread with the butter soaking in. Unusually the milk jug poured without a drip escaping the cups and my cake was very nice as well, so I was happy. Jo’s sister (who was paying- thank you Kate!) was not so lucky in the cake department, with a bit of a tearoom shocker… they were out of fruit scones!!! Jo’s all keen to start a dedicated tearoom review site so I’d better get thinking of a proper rating scale… teaspoons maybe? Any suggestions for good places for tea and cake to try out? After a few discussions with Andy recently I’m toying with the idea that social software is like a global kitchen. A kitchen is a good place for a nice cup of tea and a sit down when friends or neighbours pop round, and it’s where a large proportion of the guests are likely to be found at a party (and coincidentally where all the alcohol is). Like the kitchen, Weblogs, Dopplr, Flickr, Facebook, Twitter, and (insert your favourite here) all provide a sociable place you can connect to people through. Unlike the kitchen, the people can be from anywhere, and they can stop by at any time to leave a note on your fridge, even if you aren’t in. I find it fascinating how people are connected; for example, Andy and I connected a contact he has made online with someone I know in person (and only recently discovered has a blog, through Facebook!) in one degree of blogroll. It seems to me that the people you meet in person and those you meet online are no different, and there’s quite an overlap anyway: people you meet in person move away, and you can meet people in person that began as virtual friendships (Dopplr perhaps makes that more likely). I often struggle to remember when, or how, I first met someone but the process seems to be similar whether in person or through social software. You can be introduced to a friend of a friend in person or on LinkedIn, and you can bump into someone randomly on the way to the fridge or stumble upon their weblog by chance. One thing that I do find odd is that, despite their primary purpose, sites that record your network of contacts don’t seem to help making those contacts in the first place. At least in my experience, I have only ever added someone to my Facebook or LinkedIn network after meeting them elsewhere. What the heck is a non-meta friend anyway?